Maximum sustained winds have risen to 160 mph with higher gusts in hurricane Irma. Hurricane Irma regained Category 5 status late Friday with maximum sustained winds of 160 mph as the core of the storm made landfall in northern Cuba. Irma made landfall on the Camaguey archipelago of Cuba late Friday night, according to the National Hurricane Center. Forecasters with the National Hurricane Center and media meteorologist say Hurricane Irma’s wind speeds will increase after Irma passes Cuba and passes over extremely warm waters between Cuba and the Keys on approach to Florida. “Nowhere in the Florida Keys will be safe,” tweeted the National Weather Service Key West. Though the core of Hurricane Irma as the most power, winds from Irma extend with tropical-storm force cover 70,000 square miles, which is larger than the area of the entire state of Florida (65,000 square miles). At some point during the storm’s progression this weekend, the entire state of Florida could experience at least hurricane-force gusts of 74 mph or greater. One of the biggest dangers are storm surges up to 12 feet water depth increases in coastal areas, which could “inundate so many low-level houses, especially on the Keys. The Everglades could also be hit hard, but fortunately the Everglades region is less populated. US and European forecast models predict the eye could hit the Keys about 8:00 a.m. Sunday and then the Everglades west of Miami late Sunday afternoon and Sunday evening. Central and North Central Florida will feel the full force of the diminishing Hurricane Irma by Monday morning, but the hurricane might remain a Category 4 into north central Florida. Irma is forecast to be a Tropical Storm in Georgia by 8 PM Monday, and a Tropical Depression in Tennessee by 8 PM Tuesday. 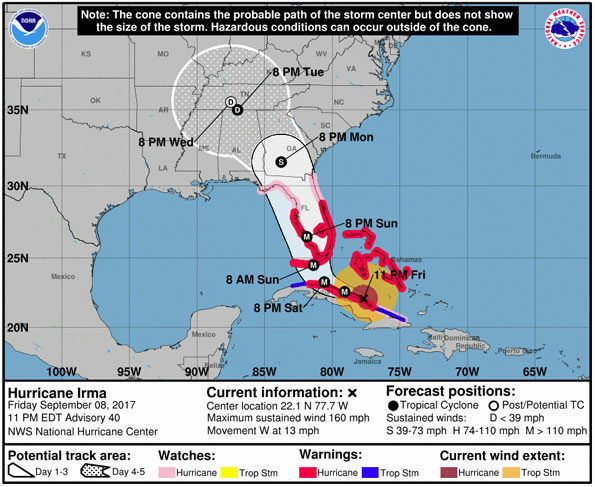 Irma Cone Map September 8 2017 at 11 PM EDT.